Reactis® V2016 was released today offering support for MATLAB® R2016a, Simulink® data dictionaries, and Windows 10. 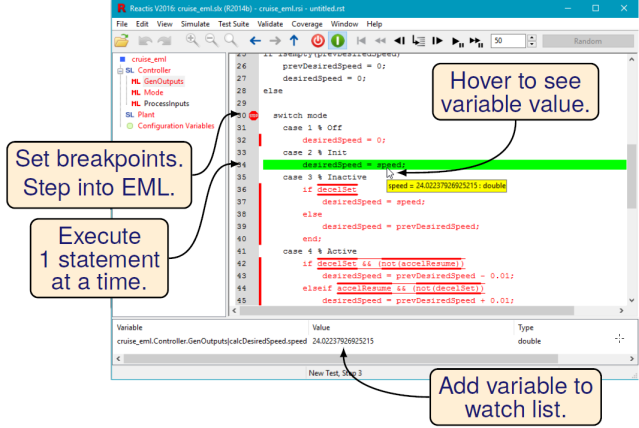 The update also adds a number of new features in the Reactis for EML Plugin to support interactive debugging of Embedded MATLAB code. A new option is also available to use the Z3 SMT solver to improve the coverage of Reactis-generated tests and to improve the static analysis employed to detect unreachable coverage targets. Embedded MATLAB (EML) code can be incorporated into models using the MATLAB Function or Truth Table blocks in Simulink; or in MATLAB functions in Stateflow. Reactis V2016 lets you step into such EML code and monitor variable values as statements execute. Each statement is highlighted in green as it executes. You can execute a statement-at-a-time or set a breakpoint on a line so that simulation pauses when the line is reached. Variable values may be observed by hovering with the mouse over a variable name in the main panel or adding the variable to the watch list which appears at the bottom of the Reactis window. Some of these capabilities are visualized in the screenshot below. It is now possible to assign pre-compiled C libraries to be used by Stateflow custom C code. This can be useful if white-box testing of a library is not the current focus of testing. In this case, a maintainer of the library can use Reactis to compile the library into a single byte code file that can be distributed to users of the library so those users do not require the C source files comprising the library when using the library in Reactis. It is now possible to reduce the error checking in Reactis for C such that incomplete variable or function declarations are ignored if they are never used. The argument of a #include directive can now be a macro. Reactis now produces warnings instead of errors for GCC-style extended "asm" statements (the assembly code will be ignored). Several other new features are also included. Reactis now includes a setting to relax type checking in Stateflow to allow the comparison of enumerated values that are of different types. Such comparisons can now be flagged as an error, as a warning, or ignored. A new entry in the top-level Coverage menu lets you launch a quick HTML coverage report from within Simulator. The CSV test exporter now includes an option to export Boolean values as integers. Finally, the Tester launch dialog now offers an option to enable or disable the pruning of tests after the random phase. Disabling pruning can be useful if you wish to generate a set of random tests all of the same length. Previously, Reactis always pruned steps from the ends of tests from the random phase if the steps did not exercise new coverage targets. A number of new API functions have also been added.